Children suddenly disappearing and their desperate parents trying to find them is a premise that has been done in movies many times before. Yet Strangerland (not to be confused with Dee Snider’s 1998 sicko horror shlock Strangeland) manages to create a compelling drama and mystery. 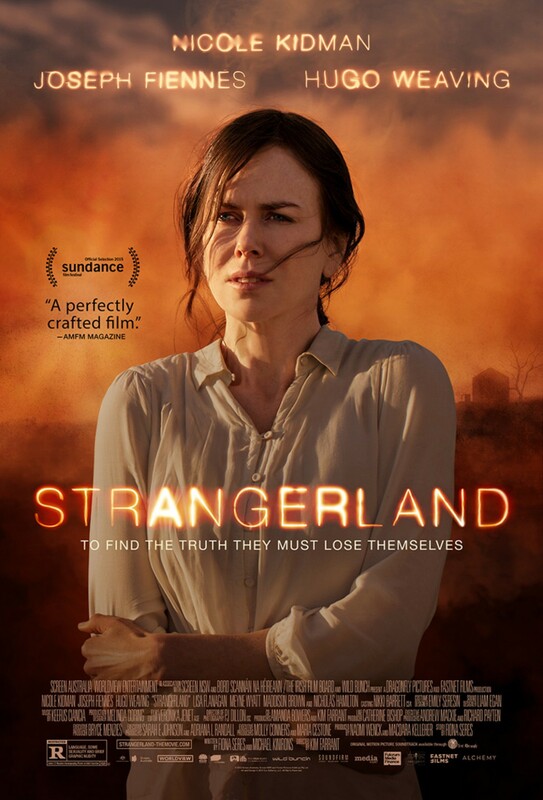 The children that are the catalyst of Strangerland are siblings and they vanish right before a dust storm hits their small town in the Australian outback. One is a promiscuous female teenager rebelling against her parents as she comes into her own, and the other is her shy preteen brother who is prone to wandering around at night by himself. Nicole Kidman and Joseph Fiennes play their parents and are the center of the plot as they frantically search for their children once the dust settles. The film is shot in a very dry yellowish tint. Even before the dust storm hits the cinematography paints a picture that shouts of grimy desperation and looks like the dustbowl areas during the great depression. It works for the story and is so effective that by the end of the film you might need a drink of water because even interior scenes feel like you are in the desert. There are no bright colors and everything looks like it is painted in varying degrees of faded and drab hues. Some of the wide shots of the landscapes are so striking that they are on par with images from a Terrence Malick film. The music is scarce and that is a smart move by the director because it allows you to focus on the performances to carry the story. The strongest being Nicole Kidman, showing that she can still deliver a strong rendition.She bares all in a very brave and emotional way.This is the best she has been in quite a long time. The other performance to relish is Hugo Weaving who really shows his age in this film (he was the main villain from The Matrix sixteen years ago, which is hard to believe) and he does a great job as the detective in charge of investigating the missing children. From the moment you see him he and the director do a good job of always making you second guess his motives and if he is genuine in everything that he says and does. Inevitably, Strangerland does drag at times. The pacing is not always compelling and some scenes feel important while others feel superfluous to the point where you might forget why the characters went to a location in the first place. That may be a problem with the script as much as with the editing, in this case it is difficult to tell where the blame should be placed but some moments feel urgent and others feel very blasé. In the end, Strangerland works best as a melodrama more than it does a mystery. If they tinkered with the screenplay a little more it could have played like a more gripping missing person mystery like last years Gone Girl. Instead the great acting really carries the film, not the plot. As these characters search for the missing children we learn more about the children’s secrets and more about the adults that are trying to find meaning in their lives as fate has just handed them a new purpose for their existence.